Buy a wall calendar and hang it on the wall where you practice. Every day that you practice, put an X through the box with a red marker. As your chain of Xs grows, say to yourself, “Don’t break the chain”. Go to the downloads page to get the latest practice calendar. I love this. It’s such a simple goal: Write every day. 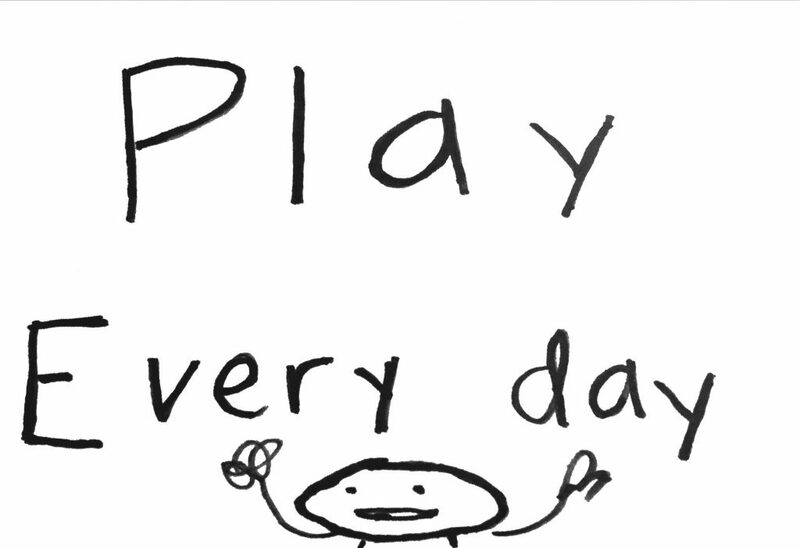 Play every day. Exercise every day. And the tracking system is beautifully minimal. Just make an X in a box. The chain is its own reward, better even than ice cream (I guess that’s up for debate). As that chain of Xs grows you will say “Yes! Yes! Yes!” It feels good once you get in the swing of practice. Some students are more goal-driven. They get motivated by having a definite goal to work towards: Learning ten Irish reels. Recording an album. Performing in a show. In fact, if you are trying to become an expert performer in your field it’s necessary to be setting concrete goals to work toward. If this sounds like you, I encourage you to set goals and create a series of small action steps to help you achieve that goal. 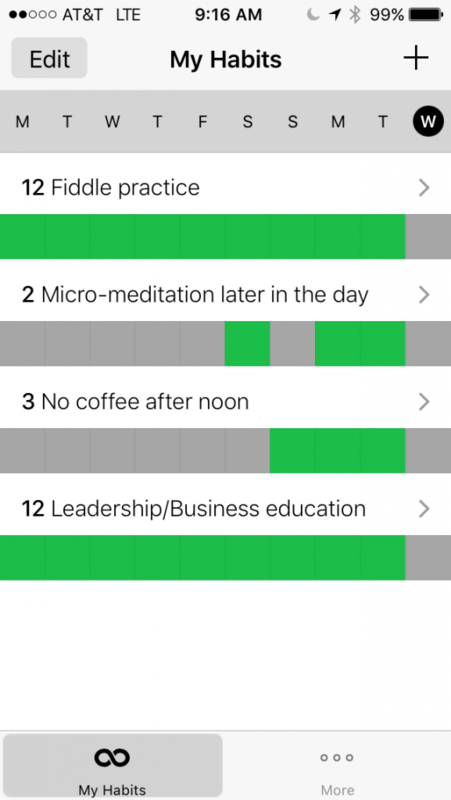 With this you can easily keep track of multiple good habits you are maintaining. Don’t feel like buying a wall calendar in the middle of the year? No problem! 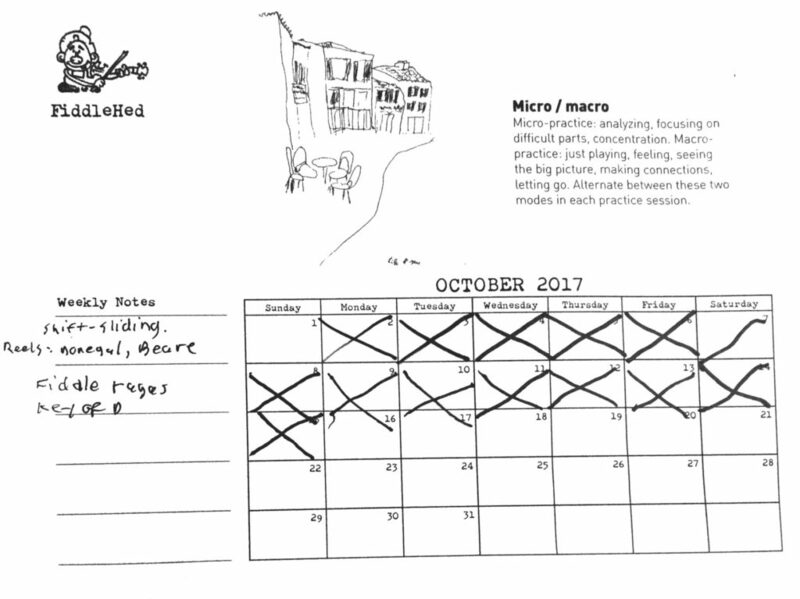 We made a special FiddleHed Practice Calendar for you. You’ll find it in the first lesson of How To Practice Consistently. Great ! I’m gonna play every morning and bear the music in me all day long. Love it! Just printed your awesome calendar! Oh good. Let me know how it goes. Hey Jaso’n. Hope you are doing well. I love the idea of your app but can you say who wrote it or published it? there’s a zillion out there. Some are obviously not the one you have. question about the little fiddlehed tune book, 1.1 is not supposed to be in it? want to make sure i didn’t screw up the pdf. Here’s a link for iTunes App Store. I’ll be on vacation in Asheville, NC from October 17 to October 23. Here’s some things I think I can do to keep participating. – Get tickets to see An Evening with Alasdair Fraser and Natalie Haas, October 22, 2017 @ Isis Music Hall ! – Listen to recordings of my playing and imagine how I’d adjust it. *if I went to an irish session, fiddle camp or bluegrass jam that day –and what tunes I did there if I can remember them all! How do we get that cat graphic for our calendar?? I ♥️ stickers. Good idea. I want to make some for students. Hi I’m new to the course, but so far I love everything I have seen! Your play-along practice tracks are just what I have been looking for – and I even like your sense o humor! I anticipate being with you a long time!